So, thanks to everyone who read last week’s recap of Fashion Star, the new fashion-based reality show on NBC. Based on the great feedback and traffic (umm.. thanks Macy’s Facebook page! ), the Fashion Star recap is going to become a weekly feature. Reality Steve, (actually, make that Lost Angeles) here we come! I was really excited for Week 2. The first week of a new reality show is like an awkward 7th grade slow dance. The boy (the show) is trying to be cool and make a good impression, but occasionally gets way too excited and does something out of control (i.e., the opening with the rock music and the models strutting out in Elle MacPherson Intimates). The girl (me.. and um, my husband) is trying to feign disinterest, and downplay any attraction. She pretends like she “isn’t into it” and “doesn’t have time” to commit. But in the end, she knows she is in it for the long haul, and needs to rearrange the priorities on her DVR. Peter Gabriel, anyone? Without further ado, here are the Josie Girl’s Top 10 Takeaways from Week 2 of… Fashion Star! 1. Favorite 1: After not being in it to win it to in it last week when she put a tie-based accessory over other people’s clothes, Kara put out some rocking looks this week. Her boxy dresses were chic, modern, wearable, and flattering. And, like the Josie Girl, she’s a teacher! Kara took a huge step up. FAR AND AWAY my favorite looks this week. Available at Saks! 2. Terron… Schaefer: For the second week, the Saks buyer brought it. His presence brings a dignified air to the show, and I LOVE his demeanor, sophistication.. and wardrobe! I don’t think the show would be the same without him. Is there a rule that every fashion/dancing/food based reality show has to have an older, dignified judge with a cool voice? I feel like that’s written down somewhere. And I wish Ken would grow his facial hair. Not going to happen. 3. Jessica Simpson: She is continuing to grow on me, and seems very approachable and real. I saw some other people criticize her last week, and say she shouldn’t be a judge. People… she has a BILLION dollar clothing business, bigger than any other celebrity! Anyone else who has their own billion dollar business has the right to say she shouldn’t be a judge.. Everyone else?…. Zip it! And did you see her on this month’s Elle cover? As a 7-month pregnant lady, I hide my whale body in jackets and billowy sweaters, so the fact that she can rock an uber naked body on a magazine cover is amazing — hats off to her! Brave, at-peace, and beautiful. Jessica Simpson rocking out in her birthday suit on the cover of Elle. 4. Nicole Richie’s headbands/Elle Macpherson’s sequin shirt: Suggestion to producers: instead of limiting the available looks to the designs created by the contestants, can we PLEASE include the wardrobes of the judges? If so, I would take Nicole Richie’s headbands and Elle Macpherson’s sequin shirt from last night in a second. They both looked great.. Can we just make the show about them? Reality TV.. This is why we love it. 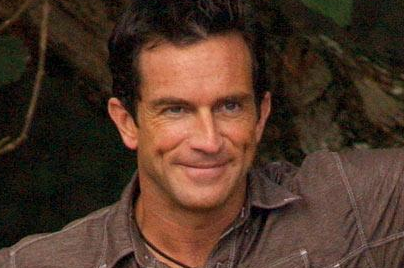 Not going to lie, Jeff Probst is one hottie. 7. Commercials: In order to live tweet the show, I had to watch Fashion Star live (@JosieGirlBlog for those of you on Twitter). I can’t remember the last time I had to watch a show live (my DVR is probably one of my top 5 prized possessions). I completely forgot how annoying commercials are! Yes.. cry me a river… #21stCenturyProblems. 8. Ross Bennett: Ross, who frequently goes out of his way to point out that he is straight (and married), has been a bit of an enigma. He has frequently been complimented on his personal style and his tailoring skills, but his clothes always fall short of receiving a bid from the buyers. I guess the bow tie is cute (and different), but the sunglasses on top of his head 24-7 thing kind of kills me. It’s one thing if you’re outside, and there may be a possibility that you would need sunglasses. But c’mon Ross. It’s dark inside. Can’t you take those things off of your head? Please? And yes, I know you are straight (and married). 9. Favorite 2: Nzimiro’s men’s looks got bought for the second week in a row. Congrats! It was good to see more of his personal story too. He gave up an engineering career to be a designer. And it was kind of funny to see his parents, who could not have looked less psyched about his career decision. Fortunately for him (and them), he has been one of the few consistent positive surprises on the show. 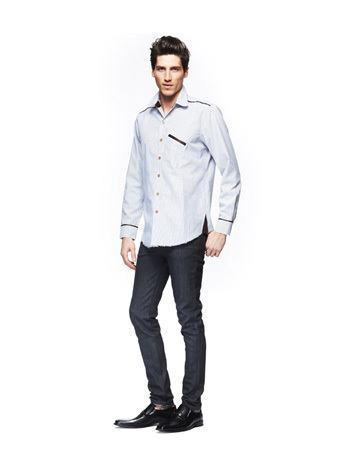 His men’s shirts were well-tailored and slim fit, and the diagonal pocket gave them a little bit of distinctiveness. 10. Final Result: Usually, reality TV producers keep lightning rod characters on a show longer than warranted due to ratings and viewer attraction (Bentley! Wes! ), so I assumed Oscar would be on the show for a while. Unfortunately, his looks were passed on two weeks in a row, and the buyers made their decision to get rid of him. Sadly, the Oscar vs. Orly conflict has seen its end (hopefully a new one will come up). Some people jokingly say about cute people that “I want to put him in my pocket.” Oscar is so small, I literally think I could put him in my pocket. And I have small pockets. Readers.. what did you think of Week 2? Did any of you buy anything? Comments please!!! Hysterical! I liked Kara best too. Nothing else was overly inspiring. I feel like they are jamming too much into one hour. I get kind of dizzy by the end of the show. I think the show will get better as more contestants ger eliminated. Keep posting! I think only a couple of the designers have talent…..maybe they will surprise us next week? Definitely watching next week though. Totally agree on Elle and Nicole Richie. Give me their clothes instead!! TERRON!!!! My fave.. Love him. He was a lot to handle, but I will miss Oscar. He was entertaining, at the very least. I really like Ross’ aesthetic, and apparently so does Oscar (de la Renta) because Saks has a bolero jacket right now by Oscar that looks EXACTLY like the one shown last night. I loved the palazzo pants last week, too. I did love Kara’s dress last night, beautifully tailored, but the dress on Saks.com fell short for me. I wish they had produced in the red, not the glen plaid, although I will go look at it in person–may not translate well online. Good point — I do agree with you though that the red dress should have been produced in the red. I know Oscar de la Renta loves the bolero look, but you definitely have to have a certain type of body to rock that look. I love watching Terron Schaefer on the show. His quiet dignity and elegance speaks VOLUMES!! Boy- if looks could kill!!! And I, actually, LIKE Jessica Simpson. I don’t feel that any of those outfits belong on a anyone but a Jessica Simpson customer :-).